This lent we have talked a lot about service, meditation, sacrifice, and one can consider those as three supporting walls in our life’s drama, and we act our lives in front of our audience, God. Sometimes the play goes off like clockwork, but sometimes we forget our lines or forget to block properly. Even worse is when someone else blows their part and it ruins the play for the others. At some point in our life it appropriate to turn to the audience and address God directly through prayer. And no matter how bad the play or how many times we’ve forgotten our part “he himself is our peace and he breaks down that fourth wall.” No play is a failure or a dud its a roaring success in his eyes. 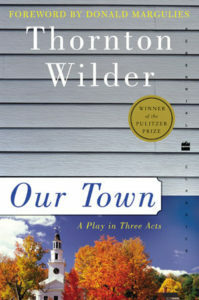 As Lent draws to a close it is time to turn and speak to God directly, much like the narrator in Our Town. God will break down the fourth wall and say “Good job, true and faithful servant” no matter how many lines we blew. Editor’s Note: There is always a debate when Lent ends, and I when can have my oatmeal raisin cookie. I still hold to the pronouncement of Little Rock’s matriarch, Mrs. Worthen, who says Lent ends after one attends church Friday noon. Many others differ with her opinion, and please don’t ask what happens if you don’t go to church on Friday. According to Mrs. Worthen that wasn’t a possibility. Whenever Lent ends thank you for joining the Pew during your Lenten journey and have a Happy Easter!